Northern Ireland's Will Grigg pictured at a press conference ahead of the World Cup Qualifier against Azerbaijan. Will Grigg believes his early-season goals at Wigan have answered those who questioned whether he would be impacted by his Euro 2016 snub. The 25-year-old was in France for Northern Ireland’s first ever European Championship finals, though he was one of three unused outfield players, not that those with a passing interest would have guessed given his name became an anthem, not just for his country, but the whole tournament. Grigg admits there was frustration that he was not able to show a wider audience he was far more than just the subject of a catchy terrace chant, but, now back in the Northern Irish squad after scoring six goals for Latics, he thinks his record in the second tier of English football proves he has bounced back. “I went to France as a footballer, not as anything else, so to not play a minute was tough,” he said. “It was really disappointing and it was a tough time. I went there as part of the squad and you’re not guaranteed to play and that’s what happened. “It’s one of those things, you have to get back quickly and there probably were a few question marks, whether I’d come back flying again and I certainly did that. “It wasn’t a case of me going back sulking, or anything like that, it was good to have a good start. “I’m clever enough to realise that’s what happens in football - you get questioned constantly. I think that was always going to be a little question, whether that was justified or not there was always going to be a doubt, and it’s nice to prove people wrong. His ‘Will Grigg’s on Fire’ song, a reworking of Gala’s hit ‘Freed from Desire’ is still inescapable around The Green and White Army, as was epitomised by the fact the original was the first song played over the PA after Germany’s win over the Northern Irish in Hanover last month. Not that Grigg, who missed Michael O’Neill’s past two squads following the birth of his child, will allow that cult-hero status to inflate his ego. “Anyone who knows me as a person, it’s not one of those things that will get to my head or anything,” the striker added of his chant. There may be opportunities for Grigg in either Friday’s World Cup qualifier against Azerbaijan or next week’s friendly against Croatia and victory in the first contest will see the country go into second place in their group, behind the Germans, as they bid to qualify for back-to-back major tournaments after a 30-year absence. 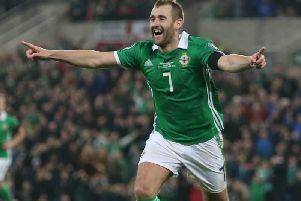 Asked what had changed under O’Neill since his debut four years ago, Grigg said: “If I knew that answer I’d be selling it for a lot of money. I don’t know, it’s probably a similar group of players, we’ve got that experience over the last two or three campaigns. O’Neill, who saw Stuart Dallas and Jamie Ward withdraw from his squad earlier this week because of injury, has now included Ross County striker Liam Boyce.